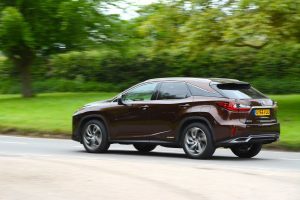 The Lexus RX450h is a large, refined and luxurious SUV with a petrol-electric hybrid powertrain that can deliver good economy if driven carefully. Toyota and Lexus have focused on petrol-electric hybrids for a number of years now, and with all the recent bad news about diesel engines and their emissions, resulting in poor local air quality, perhaps now is the time for Toyota to reap the rewards from its hybrid approach. The Lexus RX450h has a 3.5-litre V6 engine with an electric CVT transmission, together with a battery and electric motor. The idea is that the car runs on its electric motor when it can, and when the battery that supplies power to the motor is depleted of energy, then the car replenishes the battery all by itself, primarily through brake energy regeneration. This means there is no need to plug in the vehicle to recharge it. Unlike virtually all competitors, there’s no turbo – Lexus believes there’s no need for this due to the RX450h having an electric motor to provide more power and torque. The powertrain offers the capability of all-wheel drive. Following in the footsteps of its little brother, the Lexus NX300h, the RX450h has striking looks, which help to differentiate it from rivals. 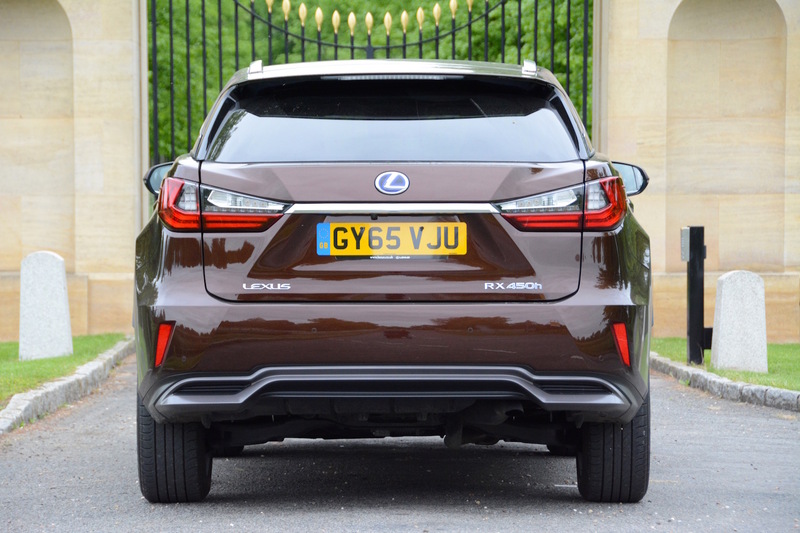 Traditionally the Lexus brand was a favourite amongst golfers in their 50’s, however the company is obviously looking to change that with its new, more dynamic styling. 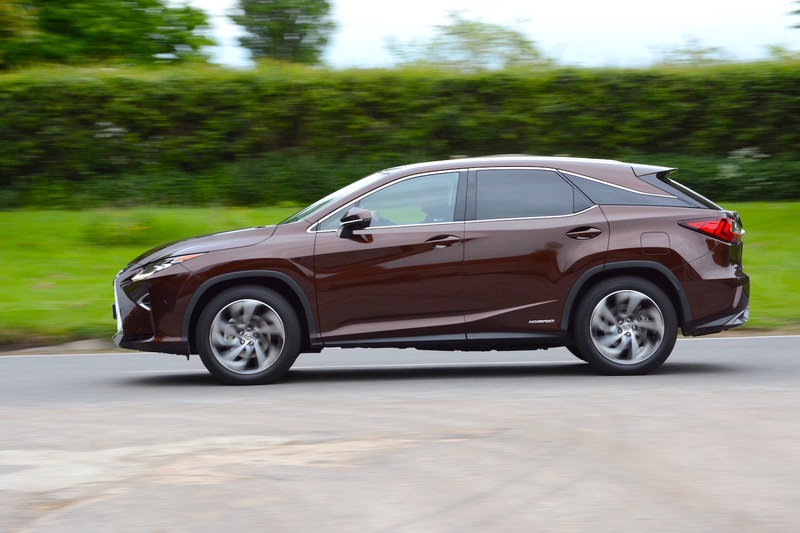 We think the RX450h looks good (although the ‘Copper Brown’ colour of our test car- a £645 option – may be a subjective thing), and inside, the interior feels upmarket and is a pleasant place to be. However the wide centre console seems to steal space that would be better served for the left knee of average and above-sized drivers. Overall the Lexus RX450h feels upmarket, quiet and refined to drive – both around town and at higher motorway speeds. The hybrid system helps in this area – if the car can drive in zero-emission and virtually silent electric mode, it will do. 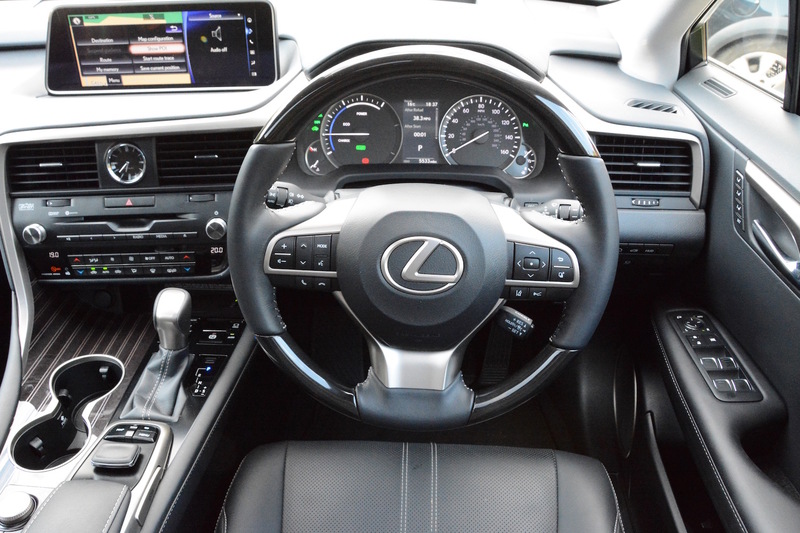 The RX450h also has a good ride, resulting in a comfortable driving experience. However if you need performance, then this can also be delivered thanks to the combination of the 259 bhp engine and 335 bhp electric motors (bizarrely giving a total system output of 308 bhp), together with the torque of 335 Nm from the engine with 335 Nm from the front electric motor and 139 Nm from the rear electric motor. Although the RX450h has the capability of all-wheel drive, we can’t imagine many owners discovering the limits of the system off-road. However the all-wheel drive capability does offer more grip than just a two-wheel drive system, especially in snow or other slippery conditions, but before you get any grand ideas, the handling is as per the laws of physics dictate for a high and soft-riding large SUV. In the past the CVT systems of most Toyota and Lexus hybrids have had one overwhelming feature – they were very revvy when accelerating. No doubt following years of reading the same complaints from motoring journalists around the world, Toyota has at last felt the need to address this issue by re-tuning the system, and this characteristic, although still present, is much less evident in the latest RX450h, which is a very welcome relief. Earlier Toyota and Lexus hybrids also had particular braking characteristics; as you pressed the brake pedal you could feel the transition between mechanical braking, hybrid brake regeneration, and then finally mechanical braking again. All this resulted in braking feel that didn’t feel as natural or as predictable as a conventional car, however this has also improved with the latest RX450h. There are various different drive settings to play with, including Eco, Normal and Sport, although the mode button is slightly hidden away to the left of the driver’s reach rather than being easily accessible. There’s also the option to hold the car in pure electric mode, however due to the relatively short range of the hybrid battery, this facility is often not available. You can select D or S via the CVT transmission, and there are six ‘simulated’ gear ratios, but perhaps surprisingly there are no steering wheel-mounted paddles to change gear. 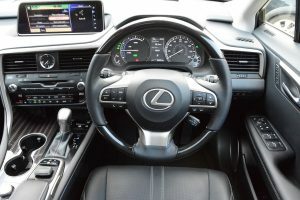 The RX450h’s steering is reasonably well-weighted and Lexus has gone for the ‘comfort’ option rather than making the steering feel particularly sharp or precise. The Lexus infomedia system features a wide screen, and the good news is that there’s a controller to save you the pain of having to reach over in a moving car to try to press various small buttons on a screen. However the controller for the screen is based around the concept of a computer mouse, which unfortunately also isn’t ideal for a moving car – it’s more tricky to press the desired button using this than with BMW’s iDrive system, for instance. The Lexus RX450h has an official combined economy figure of 51.4mpg (equating to 127g/km CO2 emissions). Interestingly, the urban and extra-urban figures are also 51.4mpg. So how do these figures translate to real life? At 50mph the RX450h averaged 58.5mpg. At 60mph this reduced to 48.7mpg. At 70mph this dropped to 40mpg. Although hybrids can deliver impressive official fuel economy figures, in mixed real-life driving, the extra weight of the hybrid system, which results in a total kerb weight of 2280kg, doesn’t help with good economy, especially with lots of acceleration. This was no doubt a contributing factor in our overall average fuel economy over a week of 42.4mpg. Although this is down on the official 51.4mpg figure, this is actually not bad for a 2280kg SUV primarily powered by a 3.5-litre V6 petrol engine. 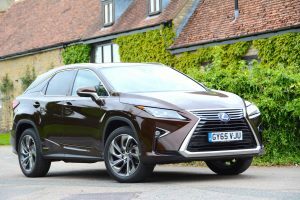 Strangely, the average fuel economy after a week with the Lexus NX300h, after a similar overall drive cycle, was a disappointing 31.1mpg – i.e. less than the larger RX450h. 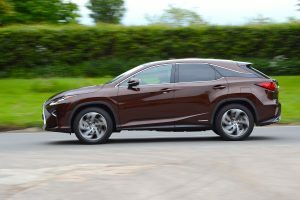 Around 70-80% of Green Car Guide’s driving test cycle for most cars is on motorways, so we can only assume that the larger V6, 3.5-litre engine of the RX450h is more relaxed at 70mph, whereas the 4-cylinder, 2.5-litre petrol engine in the NX300h was having to work harder at this speed. 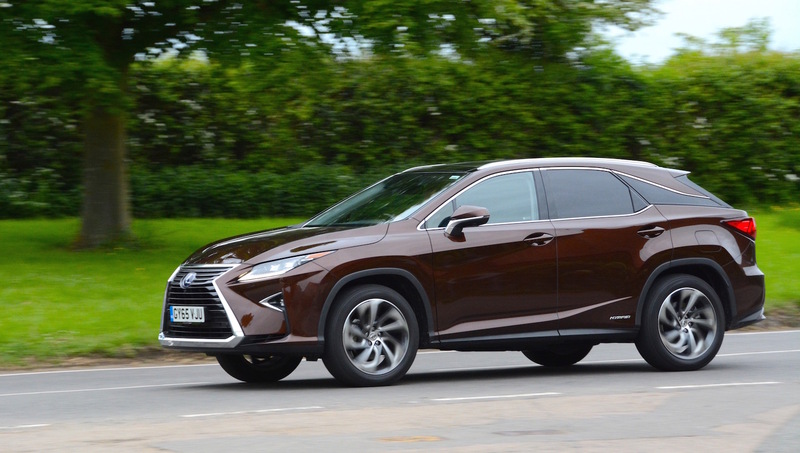 However we also understand that Lexus has recently re-tuned the hybrid system, which may also have had an impact in favour of the newer RX450h. In summary, like most hybrids, real-life economy in the Lexus RX450h really depends on how you drive. If you drive carefully then you could come close to 50mpg – however the car’s weight and aerodynamic bulk will always be fighting against this. 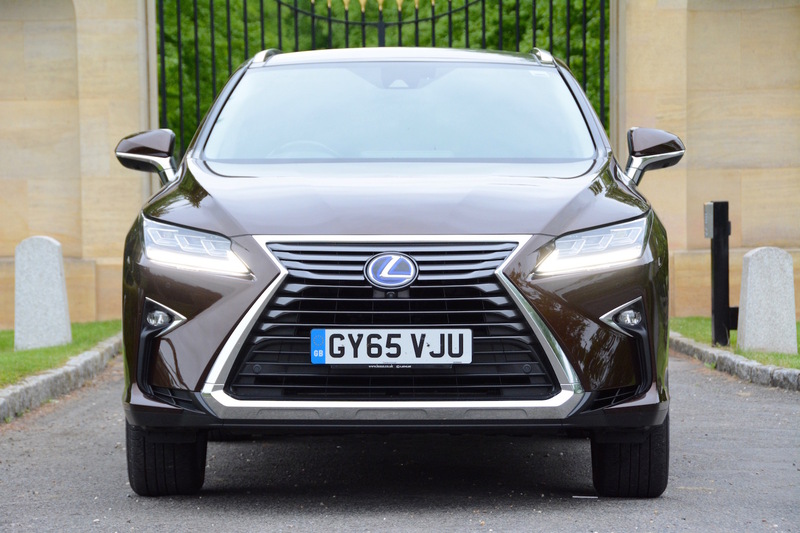 The Lexus RX450h costs £57,995. 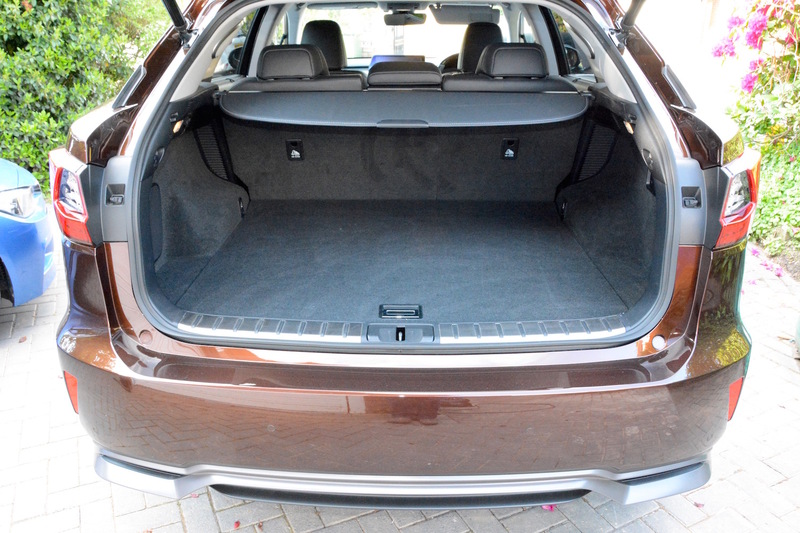 Our car had two options, the Copper Brown paint (£645) and a panoramic roof (£1,295) – taking the price to £59,935. Unlike some German cars, a big long list of options wasn’t needed as the standard equipment is fairly generous – as you would hope is the case in a £60,000 Japanese car. If you like the look of the RX450h but don’t want to pay the £57,995 of our Premier spec model, then don’t panic – the RX450h starts at £46,995 in SE trim (rising up through Luxury and F Sport to Premier). And if you don’t want the Hybrid model, then there’s also a 200t model – with a turbo petrol engine. The 200t S has just two-wheel drive and costs £39,995. There’s also the all-wheel drive 200t Luxury and F Sport models. 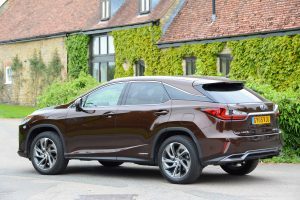 The Lexus RX450h offers a very refined driving experience, and in top-of-the-range £57,995 Premier trim, a very luxurious one. A key factor in the refinement is that the RX450h is a petrol-electric hybrid. There’s no noisy or rough diesel engine here, and with the growing awareness about the impact that diesel emissions have on local air quality, it now looks like Toyota and Lexus have been playing a smart game. Of course, local air quality issues aside, a hybrid should deliver impressive fuel economy (along with lower CO2 emissions). If driven carefully, the RX450h can score points here too. There are more and more hybrid SUVs coming to market, but the majority of other manufacturers are going down the plug-in hybrid route, meaning that you plug the car in to the mains to get a longer battery range and theoretically better economy. However to do this you need to be able to plug the car in to the mains, and once the battery charge of a plug-in hybrid SUV has disappeared, the fuel economy of such vehicles is typically in the mid-30’s. After a week with the RX450h we averaged 42.4mpg. So if most of your driving is less than 20-30 miles, after which you can recharge your car, then a plug-in hybrid SUV may be the best answer. 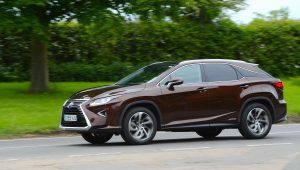 If you can’t regularly recharge your vehicle, and you want decent fuel economy but don’t want a diesel, and you do a reasonable amount of stop-start urban driving to enable the batteries to be recharged, then the RX450h may be the solution. However sales figures of 4x4s in the UK show that most people want diesels, which are seen to give the best chance of decent economy, especially on long runs. Because of this, even this latest, improved RX450h is destined to be more of a rare sight on UK roads than diesel 4x4s. However the Lexus RX450h remains an impressive technological accomplishment that can deliver refinement, luxury and potentially, relatively low emissions, and it gains a Green Car Guide rating of 8 out of 10.